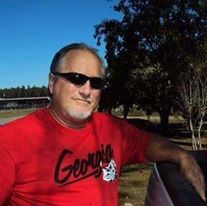 Jonathan Mark Huling, 60, of Hortense, GA passed away November 26 in Brunswick, GA. He was born April 26, 1958 in Folkston, GA. He was a graduate of Charlton County High School Class of 1976. He attended Bay Harbor Church of God in Hortense since moving to Brantley County. He was a proud patriot and retired as an Underground Utilities Contractor. He is survived by his wife: Sarah Huling; his parents: Robert and Janice Huling; children: Jennifer Rodriguz, Justin Mark Huling, Joshua Mitchell Huling, Joseph Michah Huling, Ryan (Danielle) Bass and Casey Bass; a brother: Tim (Karen) Huling and 4-grandchildren: Journey Pippa Ivey Toler, Amelia Crews, Blayde Brewer and Gabe Brewer; a niece: Mandy (Brad) Westerbeck and a nephew: Benji (Katy) Huling. Funeral services will be held Friday November 30 at 3:00 PM in the Shepard-Roberson Funeral Home Chapel. The family will receive friends at the funeral home beginning at 1:00 PM. Burial will follow in Pineview Cemetery.